In case you haven’t joined us yet at our new home at http://www.printedportal.com we wanted to share on this blog that our new visibility planner is now available on Kickstarter. My career filofax originally started looking something list this – full of hand-drawn pages to suit my needs. However, the PYO (print your own) option in our latest Kickstarter allows you to print your own inserts (suitable for an A5 filofax/planner), punch them and add them into you regular filofax or alternative planner. You should try and have a number of meetings about your career throughout the year. The Meeting Schedule allows you to write in your proposed meetings and plan your formal and informal meetings. For each meeting in your schedule there are a set of meeting pages including meeting preparation and agenda pages, meeting notes pages and meeting follow-up pages (there is room for 5 meetings excluding your formal review/appraisal meeting). You can use these as little or as much as you need and how you can use these pages will be up to you. This section is a bit chunkier and includes a few extra pages, but follows the same style as the regular meeting pages. Appraisal Preparation – Appraisal Timetable and Notes on the Appraisal Process – to help you get your head around of what your company requires of you – and a reminder of targets. Review of Goals & Objectives – At the beginning of the year you should have set goals with your boss and you will now want see where you have got to. Review of Personal Goals – The apprisal time is also a great time to review your own personal career progression goals. Self Review – This is a notes section for some freehand writing for your own self-review. Feedback and Accomplishments – part of your review should be about what you have done well! This notebook allows you to list feedback you have received and achievements (you may even want to keep this update throughout the year). Areas for development / ideas for future development – you should always have thought about this before going into your meeting – as this is your opportunity to acknowledge where you need help and ask for it! Action Points and Follow up. Feedback Notes & Objectives – In addition to the regular notes and follow-up pages there are extra pages for Feedback notes to allow you to specifically think about the feedback you received in your meeting both generally and in relation to your set objectives. Goals for next year – and we round off this section with goals for next year. The Printed Portal Notebooks Subs Club is now live on Kickstarter – help our monthly subscription of organisational notebooks (and PYO digital editions) become a reality. A lot of our readers use our Career Development Notebooks, however, I often get asked how to prepare for 1:1 Meetings and Appraisals. The Career Development Notebook is great for setting goals and tracking progress but some readers are still struggling with including their goals in their meetings with their boss as usually their boss controls the agenda. If your boss is anything like mine – they are likely to be very busy so it is important for BOTH of you that you prepare for the meeting properly so that you have a much more effective meeting. Enter the Career Development Meetings Notebook. I have designed the Career Development Meetings Notebook to sit within my Meeting Notebooks Collection (currently available on Kickstarter) and it will work with the existing Career Development Notebook. Corporate and Business Goals Pages. Career Pathways and Notes Pages. Personal Goals Pages and Progress Tracker. Future Plans and Next Steps. Future Planning / Promotion Prospects. 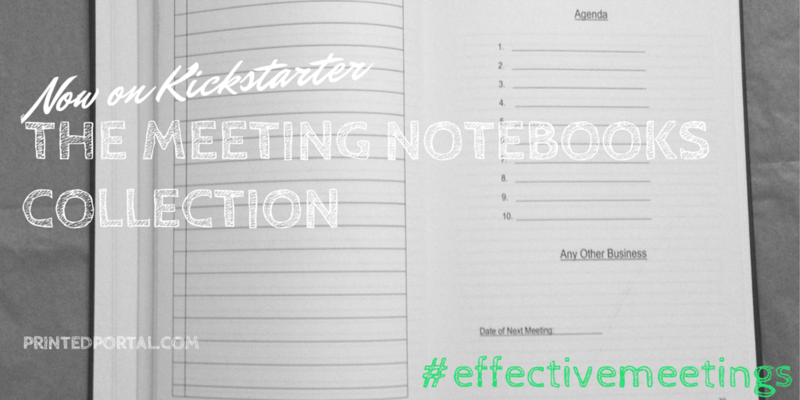 Our Meeting Notebooks Collection is now 25% funded. Thank you for your support do far and please continue to share and tweet our project on Kickstarter.